The SPH-DA120 lets you enjoy all the benefits of smartphone connectivity in your car. Run smartphone apps, listen to your favourite music, watch videos or photos, and charge your battery on the go. The SPH-DA120 also supports AppRadio Mode, CarPlay, MirrorLink and other connectivity solutions like Bluetooth wireless streaming. With the all new SPH-DA120 you are always connected. This units brings together the use of cloud and device content from compatible iOS devices (iPhone® 6 Plus, iPhone 6, iPhone 5s, iPhone 5c, iPhone 5, iPhone 4s and iPhone 4), Android™ smartphones, and MirrorLink™ enabled smartphones, as well as feature enhanced smartphone control, voice control for Siri® Eyes Free and Google® Voice Recognition, Bluetooth® hands-free calling and audio streaming, and a new graphical user interface. 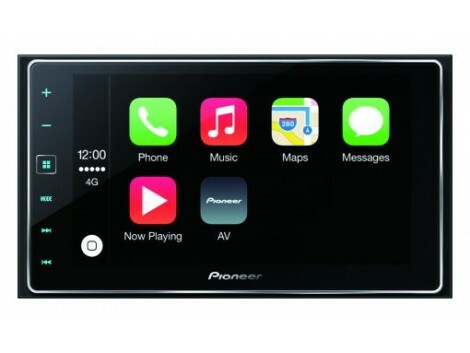 The new SPH-DA120embodies our idea of the connected car, providing the majority of smartphone owners the ability to utilize their devices in the car for calling, streaming music, and even controlling supported apps to enhance their driving experience,” said Philippe Weyers, marketing communication manager at Pioneer Europe. CarPlay Ready With CarPlay, consumers with iPhone 5 or later, including iPhone 6 and iPhone 6 Plus and the latest version of iOS can use Siri voice control to make and receive calls, compose and respond to text messages, use Apple Maps for navigation and listen to their music libraries and podcasts. For more information about CarPlay, visit www.apple.com/ios/carplay. Siri Eyes Free Users of iPhone 6 Plus, iPhone 6, iPhone 5s, iPhone 5c, iPhone 5 and iPhone devices can take advantage of Siri Eyes Free functionality with a touch of the SPH-DA120 touchscreen. When activated, Siri provides voice prompts through the vehicle’s speakers, and the user’s questions and commands are received and transmitted using the external microphone provided with the unit. Bluetooth To maximize the connectivity options available in today’s most popular smartphones, the SPH-DA120 offers both Bluetooth hands-free calling1 and Bluetooth audio streaming and wireless control of compatible devices. 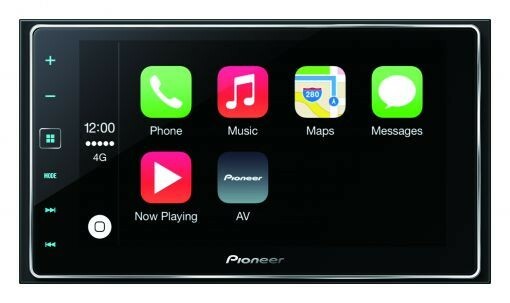 It includes Advanced Audio Distribution Profile (A2DP) for wireless audio streaming and Audio Video Remote Control Profile (AVRCP) version 1.4 for wireless control of devices and related metadata (if available) to be viewed directly on the Pioneer touchscreen display. Enhanced Touchscreen User Interface Designed with the smartphone user in mind, the SPH-DA120 touchscreen user interface (UI) provides easy access to the most commonly used features such as apps, music and calling. Built-in MirrorLink MirrorLink technology enables consumers to connect compatible smartphones to the SPH-DA120 (or other compatible in-dash receiver) via a USB cable to access certain music and map applications for a more convenient and safer in-car experience. Similar to AppRadio Mode, MirrorLink is integrated into the SPH-DA120 and offers a vehicle-specific interface and connectivity with MirrorLink certified devices from smartphone manufacturers such as Samsung, Nokia and others. Improved interface The SPH-DA120 has a simple, improved user interface that makes it more intuitive and easy-to-use like your smartphone. Thanks to its large, 6.2-inch capacitive touch screen you will also enjoy smoother and safer operation on the go. Apps in your car Hook up your iPhone 4/4s and MirrorLink devices via USB, or use the HDMI/MHL connection for your Android smartphone and control, view, and listen to music from compatible apps directly from your car dashboard. Wireless audio If you prefer to listen to music wirelessly, you simply connect your smartphone via Bluetooth. Stream your favourite tunes without hassle and take control of compatible devices. Voice commands The improved Bluetooth module includes wide band speech for enhanced voice recognition. Use Siri Eyes Free or Google Voice to browse your contacts and call hands-free without taking your eyes off the road. MirrorLink Built-in MirrorLink lets you mirror your smartphone’s content to your car display. Easily browse through your music library or engage an app for navigation. Whatever you prefer, a safer in-car experience is guaranteed. USB ports Play your favourite audio and video content effortlessly via one of the USB connection ports. Rear camera input Parking becomes a piece of cake thanks to the rear camera input. Hook up a backup-up camera (optional) to get a full view of the road and obstacles behind you. You will never miss a thing in reverse! Personalise Personalise the SPH-DA120 by changing its background to fit your preferences. Specifications: Main Features AM/FM tuner Screen 6.2" WVGA Multi-Touch Capacitive Screen Installation type2-DIN 2 x Rear USB 3 RCA Pre-outs (Front, Rear and Subwoofer) Rear Aux-In Via USB: WMA, MP3, ACC, WAV, and FLAC audio files MPEG4, WMV, H.264, DivX, DivX HomeTheatre 3.1, MKV, and FLV video files JPEG image files Bluetooth audio Other music devices via the rear Aux-In Bluetooth Handsfree Calling Phonebook Transfer Music Streaming External Bluetooth Microphone (included) GPS GPS antenna to ensure accurate positioning whilst the phone is inside the car. (External GPS Antenna included) Amplifier 4 x 50W MOSFET Connections iPhone 4: (Optional cable CD-IU201N required) iPhone 5: USB to Lightning (CA-IU.52C) & Apple Digital AV adapter required Steering Remote Compatible Rear camera input Apple Compatability Via HDMI: iPhone 5S/5C running iOS7 iPhone 5 running iOS6 / iOS7 iPhone 6/6+ running iOS8 Via USB: iPhone 4/4S running iOS5 / iOS6 / iOS7 iPod touch 4th gen. running iOS5 / iOS6 Supported Functions: Access to Photos, Calendar, Contacts, and Podcasts. Video playback Music playback Battery charging AppRadio Mode For Android Selected Android phones that are HDMI or MHL compatible. Find a complete list of compatible Android smartphones here. Optional CD-AH200 cable required MirrorLink Compatability Built In Apple CarPlay Compatability For more information go to pioneer.eu/CarPlay Connectivity cables sold separately. CD-IU201N (iPhone 4s, iPhone 4), CA-IH200V+CA-IU-52C+ Apple Lightning to Digital AV adapter (AppRadio Mode for iPhone 6 Plus, iPhone 6, iPhone 5s, iPhone 5c, iPhone 5), CA-ANW-200 (Android), CD-MU200 (MirrorLink) and CA-IU-52C (CarPlay).